After a bit of a break getting ready for, and hosting our own May the Fourth be with You Party, we are now back to the blog… though still a bit tired. So I thought we would feature something EASY today. Since we are showcasing Gene Ha while his Kickstarter Campaign is going on, today we are sharing his and (his better half) Lisa’s perfect, yet super simple, costumes from last year. Gene was dressed up as an Imperial Officer. He had his comic book fans vote on which real-life company best represents the Empire. Comcast won, hands down. 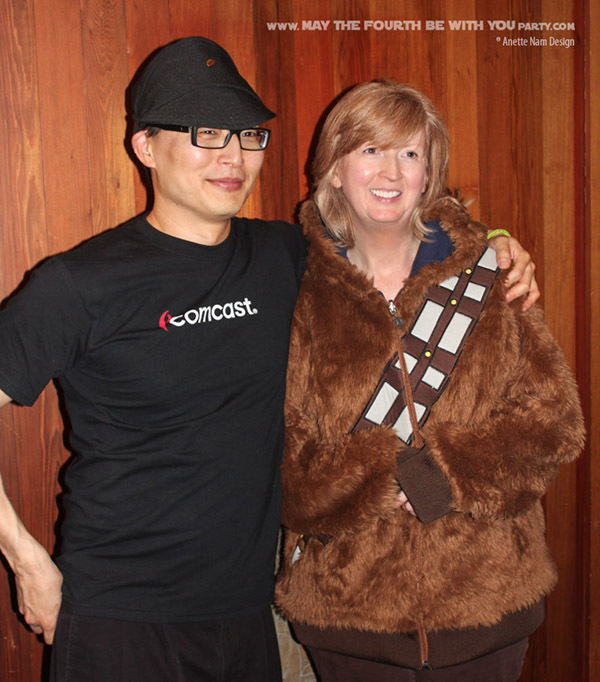 Thus, he added a Comcast logo to his Imperial Officer’s hat, made a Comcast T-shirt. Funny, Star Wars-y and perfectly party-worthy. Lisa donned THE Star Wars outfit I have been the most jealous of! I totally want one! The Wookiee jacket was a pretty warm for an indoor party, so I think it would be magnificent for Halloween. ..And don’t forget to go to the Mae Graphic Novel Kickstarter page!